I’ve been a fan of Contigo travel mugs ever since I first tried their Autoseal stainless steel West Loop model. Of course, they continue to debut new models and now I’ve got two new favorites. The Martinique is their newest premium 500ml sports water bottle with double wall, BPA free construction. The double wall effectively prevents condensation with cold drinks (goodbye water rings on my wooden furniture.) Filled with ice and the coldest water I could find, there wasn’t so much as a drop of condensation on the outside. The lid screws on for dripless drinking and is fashioned with a built-in carabiner clip to attach it to your bag or knapsack. A release button is pressed when you want to drink and automatically seals itself as you let go of the bottle. Even if the bottle tips over, there’s no chance of a spill. Best part, moms, this bottle is dishwasher safe and basically unbreakable. The Aria is available in a 16oz. size and is an upgrade of their already amazing Autoseal line of coffee mugs. This videoshows their Autoseal technology in action. With this upgrade, the mugs now come with a lockable button so the bottle can’t accidentally open when jammed in a full backpack or shoulder bag. The button can be slid open (up) or locked (down) with one hand just before you start drinking. The mug is a rich looking stainless steel and is fully dishwasher safe. Contigo claims five hours hot and 14 hours cold, but I’ve never been able to make a cup of coffee last anywhere near that long. I’m into my second pot by the time five hours rolls around. 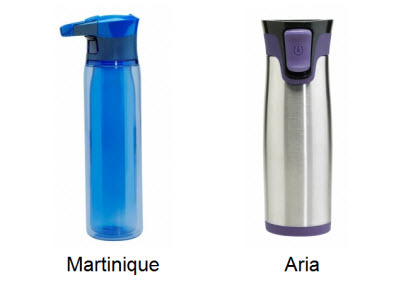 You’ll find both the Aria and the Martinique available in their webshop as well as at selected retailers.